Kristen Johns: Have you seen them? ..the camellias are opening for us. Yes, the buds are starting to open on the camellias around the neighbourhood. If you're having a dreary winter day and need something hopeful, look out for them. Camellias are a wonderful plant - glossy leaves and lovely rose-like blooms in late January, but they won't last long. Enjoy them! I will be! 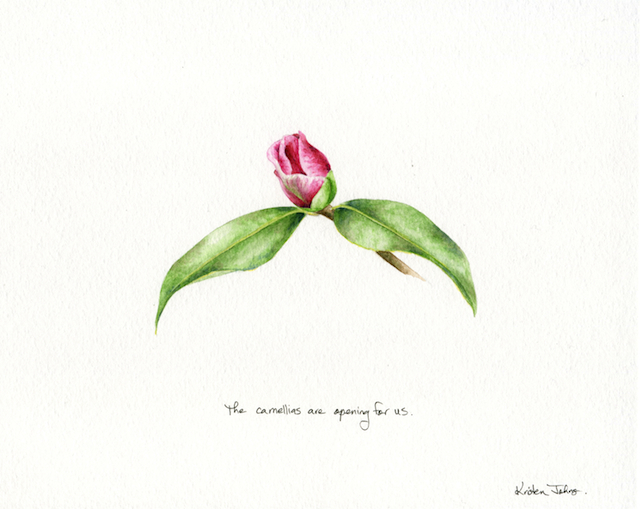 "The camellias are opening for us"
This painting is available in my shop! I'm Kristen, an artist and gardener, obsessed with painting all the plants in my backyard! Whether it's a perfect petal, a crumbling leaf, or a humble green bean dangling on a vine, it all fascinates me. My inspiration comes from the plants I grow just outside my door in my backyard garden. I hope you enjoy my backyard paintings! All images ©2016 Kristen Johns. All Rights Reserved.